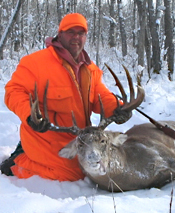 Another big one from Saskatchewan. Thread: Another big one from Saskatchewan. Not mine but I was talking with my cousin a few days ago and he told me about his buck that made the B&C books. It was 189 7/8 green. Shooter4570, Vooch, 94win30wcf and 7 others like this. Are you certain that was just not a small elk? Big horns always look small on Canadian deer because of their big body size. Put that rack on a 150 # Texas buck and it would look enoromous. Nice deer. That's a nice buck. Congrats to your cousin. Dang, Billy, your cousin dropped a NICE male of the species! Hello from east-central Saskatchewan, Canada.